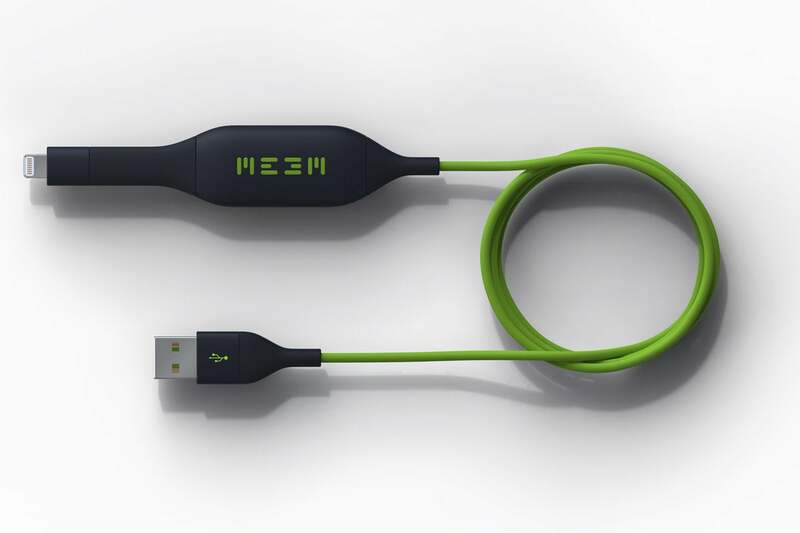 Meem (available on Amazon for $47 (32GB), $61 (64GB), or $60 (128GB)), is a USB 2.0 charging cable that includes cloud-free backup storage. 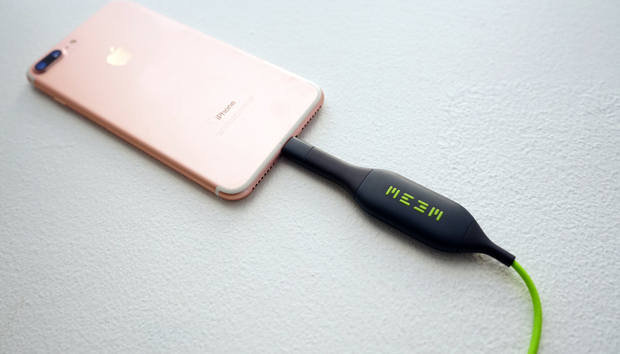 Available for iOS devices with a Lightning port or micro-USB for Android, Meem offers 32GB, 64GB, or 128GB of flash memory built into one end of a stylish green cable. A small processor is also embedded into the 120.6 x 21.1 x 8.3-milimeter black barrel at the Lightning end. The larger section of the cable is a little flexible, but be careful when setting it on a table or kitchen counter, because Meem protrudes about four inches from the device. You’ll have to provide an AC power supply like the one shipped with your iOS device, but Meem is otherwise ready to go. Plug it in and your device begins charging at 5V, then launches the free iOS companion app a few seconds later. iCloud Photo Library users may want to disable photos and videos, which require downloading full-resolution content prior to backup. The Meem app backs up contacts, calendars, photos, videos, and documents stored on up to three different iOS devices. It can’t back up everything—messages, ringtones, and other file types are off limits. The first time a device is connected you’ll create a four-digit PIN code used to access or restore data. 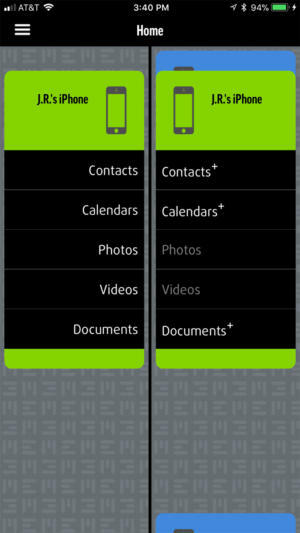 The app is laid out in two columns, with attached device at left and backups at right. Meem delays automatic backups 20 seconds, allowing users time to adjust settings by tapping a device icon to select which content types are backed up. Manual backup or restore can be done any time via drag and drop between columns, while archive mode is used to retain items from previous backups since deleted. Meem is less ideal for iCloud Photo Library users with multiple devices, since photos and videos must be downloaded before they can be backed up. Even the 128GB model isn’t spacious enough for this purpose, a problem that could be alleviated by using removable storage in future models. There’s also a desktop app offloading data to a Mac, Windows, or Linux computer. Meem is a clever combination of device backup and charging in a single product, but the lack of upgradeable storage is a limitation for iCloud Photo Library users with a lot of photos and videos.